Severe aggression is rare in stable groups, but when two Mountain Gorilla groups meet, the two silverbacks can sometimes engage in a fight to the death, using their canines to cause deep, gaping injuries. The entire sequence has nine steps: progressively quickening hooting, symbolic feeding, rising bipedally, throwing vegetation, chest-beating with cupped hands, one leg kick, sideways running, two-legged to four-legged, slapping and tearing vegetation, and thumping the ground with palms to end display. 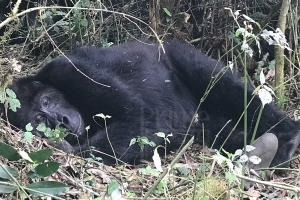 Mountain Gorilla Affiliation The midday rest period is an important time for establishing and reinforcing relationships within the group. Mutual mentoring strengthens social bonds, and helps keep hair free from dirt and parasites. It is not as common among gorillas as in other primates, although females groom their offspring regularly. 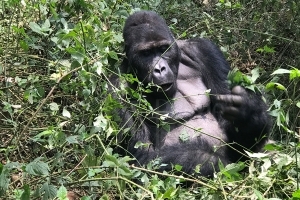 Young gorillas play often and are more arboreal than the large adults. Playing helps them learn how to communicate and behave within the group. Activities include wrestling, chasing and somersaults. The silverback and his females tolerate and even participate if encouraged. Twenty-five distinct communications are recognized, many of which are used primarily for group communication within dense foliage. Sounds classified as murmurs and barks are heard most frequently while traveling, and indicate the whereabouts of individual group members. They may also be used during social interactions when discipline is required. Screams and roars signal alarm or warning, and are produced most often by silverbacks. Deep, echoing possets suggest satisfaction and are heard frequently during feeding and resting periods. They are the most common form of intra-group communication. Mountain Gorilla Fears, for reasons unknown, Mountain Gorillas that have been studied and appear to be naturally afraid of certain reptiles. Infants, whose natural behavior is to chase anything that moves, will go out of their way to avoid chameleons and caterpillars. Koko, the gorilla proficient in sign language, is troubled of crocodiles and alligators, even though she was born in captivity and has never seen them. They are also afraid of water and will cross streams only if they can do so without getting wet (i.e. crossing over fallen logs). Dian Fossey observed and noted the Mountain Gorilla’s obvious dislike of rain, as well.